Photographing equestrian competitions calls for some standard practices. Competitors and publications have a particular type of image they generally prefer, which is the horse and rider at the apex of the fence (my blog entry for yesterday). While I enjoy the process of obtaining those favored images, I also like to experiment and try new approaches when I have the opportunity. Tonight I decided to stay for the junior/amateur-owner jumper class to simply shoot for fun and hang out with my photographer friends who had to be there. Instead of the standard jumping shots, though, I changed my settings to follow the action between the fences. Using continuous focus, I tracked the riders as they approached these imposing fences, set at about 4’6″, and captured their expressions as they prepared for flight. It was a fun experiment, and while I certainly used the delete button regularly, I also kept a few images that I wouldn’t have ordinarily shot. Even though I was running on four hours of sleep and could have been well on my 1 1/2-hour drive home, I chose to keep on “working.” I guess I really enjoy my job! Awesome photo Tricia!!! One never ever see’s this perspective. I think you may just start a trend away from the same old same old. Thank you David! It was fun to experiment! I love this! Great perspective and her eyes are just perfectly peeping over the top of his head. I need to take time to break the rules more often, too. There were a lot of deletes in this group of photos, but some did turn out! 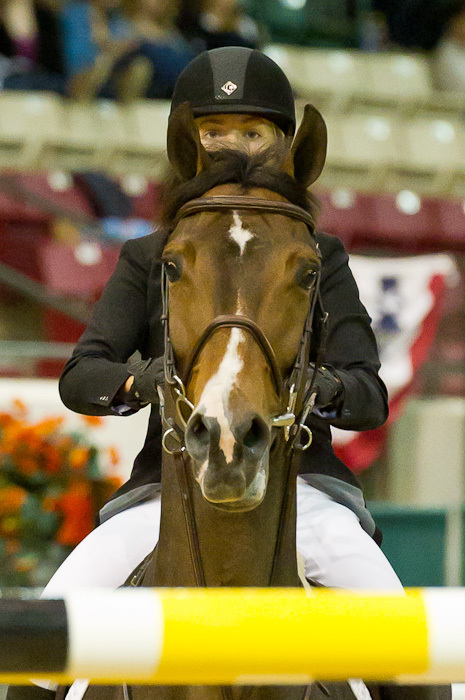 Great shot–makes the rider and horse look like one being, which they are in many ways. Some of the paradox of doing what you love. Like when you love your job it is not a job, right? Thanks for sharing. Exactly! Even after all these years I still find it fun and exciting to pick up the camera. I must be in the right place.